I was thinking about doing this last year. I wanted to send a watch around the world to WUS f10 forumers. I have a CCCP Vostok 2409A I received in a box lot over the summer. It has a burn mark from sitting in a store display under where the hour hand sat at 2 O'clock. The lume is gone from the hour hand and the dial looks like it never had any. I was told it is NOS. It does not have a band but I'm sure everyone has a bund or NATO to put it on. I'm not real fond of it but thought why not service it and send it off? Who ever wants it first, PM me your address and I will ship it on Monday. When you receive it post a photo wrist shot with a background of your choice and keep it for 1, 2, 3 days or more. When you are ready, post it for the next forumer to send it to. If it goes to Italy it may take 40 days to get there. How or why did I come up with this? I don't know. It would be interesting to see where it goes in 1 year. Note to mods, if this post is too goofy or too wacky, please delete. Last edited by Ratfacedgit; January 5th, 2013 at 00:54. WelshWatchNut, Colin63, quantumleap1 and 14 others like this. I'm ready to give her a little love. wonderful idea! well I'm one of those few forumers in Central America and I dare to say (...sadly) the only one in Costa Rica... I'll love to have it some days and to take it to the beach and the mountain ;) count with me!!! Last edited by jose-CostaRica; January 5th, 2013 at 05:21. I'll be in from Sydney Australia.. Will send my details when it has made a couple of rounds. I'm a watchbreaker not a watchmaker. What a great idea. I am currently working in Afghanistan. I'd say send it to me, but the mail here isn't very reliable and I'd hate for it to get lost. I did not think this would have any interest. Colin63 was the first to PM me at 1921. We had a similar thread in the BDWF Russian watch forum when it was still active. It was set up as a photo competition, and whoever took the coolest photos would win the actual watch. 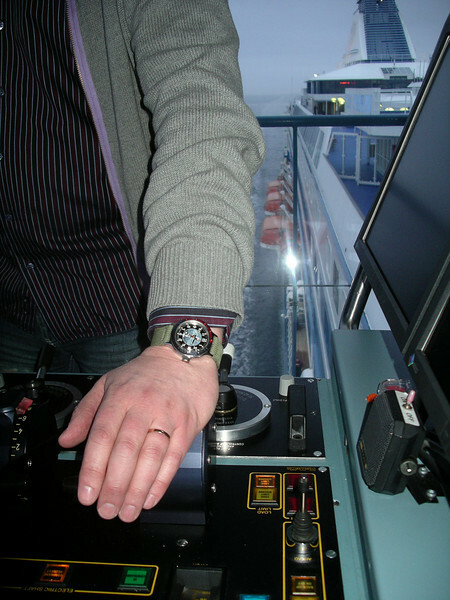 I was participating and provided the photo below, from the helm of a large cruise ship. The Captain though the idea was amusing and alowed me and my family in for a 30 minutes photo session. However, when the competition was over the forum was no longer active, and a winner never announced. But that doesn't really matter, since the fun part was to read about the watch's journey around the globe and see the creativity that went into the photos. You have my blessing if you want to go for it. cestommek, Ratfacedgit, weqtor and 6 others like this.